At the start of the new millennium, global leaders gathered at the United Nations to work on an expansive vision to fight poverty in its multiple dimensions. That vision was translated into eight Millennium Development Goals (MDGs) that have been a milestone in national and universal development priorities for the past 15 years. As the end of the MDG period approaches, the global community has reason to celebrate. Thanks to resolute global, regional, national, and local efforts, the MDGs have not only saved the lives of millions, but also improved the conditions for many more. Nearly all of the eight MDGs have been achieved before the final 2015 deadline, or were very near to hitting the targets, though progress has been uneven within and across regions and countries. As such, further efforts and an even stronger global partnership for development is necessary to accelerate progress in the post-2015 era. Extreme poverty rates have dropped by more than 50 percent since 1990. So, the next action is to end poverty and hunger everywhere by 2030. This translates to increasing the daily expenditure to more than $1.25 a day per person, and ensuring access by all people, especially the poor and those living in vulnerable situations – including infants, to safe, nutritious, and adequate food year round. Enrolment in primary education in the developing regions have reached 91 percent, so the next action is to ensure quality education for all. The goal is to ensure that all boys and girls receive a complete free, equitable, and quality primary and secondary education leading to meaningful and effective learning outcomes by 2030. This means total elimination of gender disparities in education and equal access to all levels of education, including indigenous people, persons with disabilities, and children in vulnerable situations. The world has achieved equality in primary education between boys and girls. So, the next action should be to achieve equality in all fields. This translating to ending all forms of discrimination against all girls and women everywhere, as well as eliminating all forms of violence and harmful practises against girls and women in the private and public sphere, including trafficking, sexual exploitation, female genital mutilation, and early/child/forced marriage. The mortality rate for children under five has been reduced by more than 50 percent since 1990. So the next action should be to ensure that all children live long, healthy lives. Since 1990, the maternity mortality ratio has dropped by about 45 percent. So, the next action should be to ensure universal access to reproductive health. At the same time, action should be taken to reduce the universal mortality ratio to less than 70 per 100,000 live births, reduce neonatal mortality to less than 12 per 1,000 live births, and under-five mortality to less than 25 per 1,000 live births. In the 13 year period between 2000 and 2013, new HIV infections dropped by 40 percent. In the same period, 37 million tuberculosis deaths have been avoided. So, the next action should be to ensure healthy and long lives for all. Efforts should be taken to end the epidemics of AIDS, malaria, tuberculosis, and neglected tropical diseases by 2030, and also combat water-borne diseases, hepatitis, and other communicable diseases. Since 1990, 2.6 billion people have gained access to improved drinking water, while 2.1 billion now have access to improved sanitation. So, the next action is to ensure equitable access to safe, affordable drinking water, as well as adequate and equitable hygiene and sanitation for all. Action should be taken to increase water-use efficiency across all sectors, ensure sustainable withdrawals and supply of fresh water, reduce pollution, eliminate/minimize dumping of dangerous chemicals and materials, and increase recycling and safe reuse universally by 2030. Efforts should also be taken to ensure global access to reliable, affordable, and modern energy services by 2015, strengthen adaptive capacity and resilience to climate-related hazards and natural disasters across the globe, and to promote efficient use and sustainable management of natural resources. Aid money from both developed and developing countries reached its peak in 2014 at $135.2 billion. This is the largest amount ever, following increasing aid since 2000. The next action should be ensuring a global partnership for sustainable development. 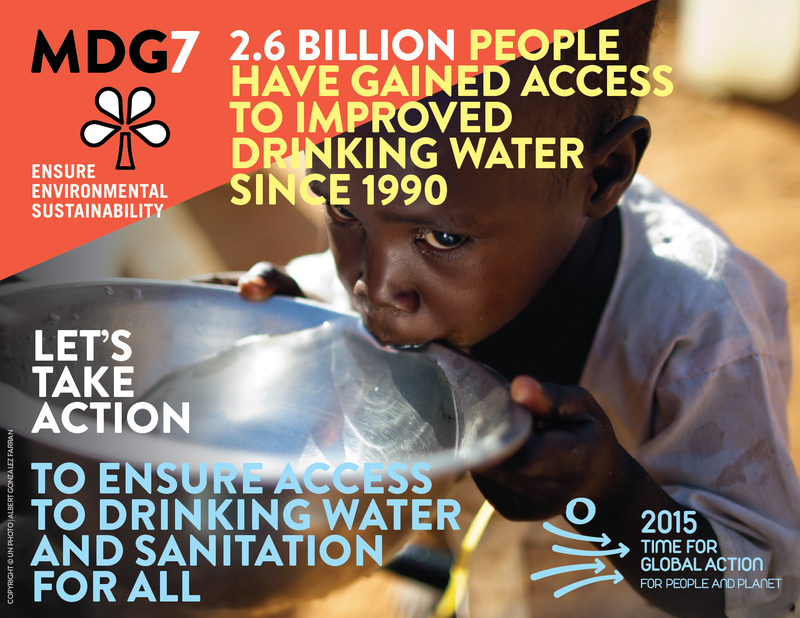 The MDGs have led to considerable progress up to 2015. So, after this period, the Global Goals should help address the challenges that remain, hopefully in the next 15 year period.